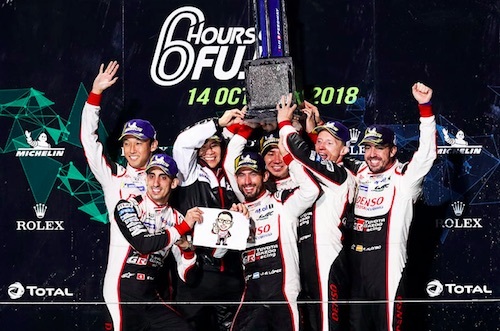 Toyota City, Japan, Oct 15, 2018 - (JCN Newswire) - TOYOTA GAZOO Racing delighted an enthusiastic home crowd by earning a one-two victory in the 6 Hours of Fuji, the fourth round of the 2018-19 FIA World Endurance Championship (WEC). A compelling race saw the #7 TS050 HYBRID of Mike Conway, Kamui Kobayashi and Jose Maria Lopez cross the line in front, just 11.440secs ahead of team-mates Sebastien Buemi, Kazuki Nakajima and Fernando Alonso in the #8 car, for their first win of the season despite starting eighth. That marked TOYOTA's sixth win from seven WEC races at its home circuit, while for Mike and Kamui it is their first victory since a memorable triumph at Fuji in 2016. It was a particularly special race for Jose, who set the fastest lap and earned his first-ever WEC win, having joined the team last season. The result extends TOYOTA GAZOO Racing's lead in the teams' World Championship to 14 points over Rebellion Racing. Sebastien, Kazuki and Fernando stretched their advantage in the drivers' standings, with Mike, Kamui and Jose moving up to second, 13 points behind. When Kazuki handed over to Sebastien after two intense hours, the #8 was around 10 seconds behind its sister car, but with newer tyres Sebastien began to close the gap on a fully dry track. The #8 took over the lead when Kamui brought his epic two-and-a-half-hour stint to an end, with Mike taking the wheel. The momentum swung between the two cars, depending on who had the newer tyres. After a full course yellow with two hours remaining, Jose in the #7 led by around 20 seconds from Fernando in the #8 and the pair pushed each other hard. Jose set what turned out to be the fastest lap of the race on lap 153 and he kept a stable gap at the front until handing the lead to Kamui with just over 30 minutes remaining. Kamui had the honour of taking the chequered flag in the #7, with Kazuki bring the #8 home second for a perfect team result. "It was a good race. We were a bit unlucky with the safety car--we were one minute 20 seconds in front and all that advantage was neutralised, but these things happen in motorsport. We were not quite quick enough to battle the #7 today; congratulations to them. They deserved it because they have been very fast all weekend. It has been a positive day for the championship; we have extended the lead in both so overall it's a very good weekend."